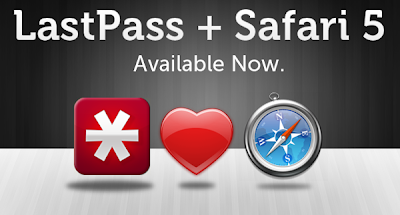 LastPass 1.68.4 has been released for Safari 5 on Mac OS X. If you haven’t upgraded to Safari 5 yet, you should be prompted to do so. If you’re already on Safari 5, you will need to redownload in Safari and run the installer package. We're currently hard at work on a native extension using Safari 5's new extension support through the Safari Developer Program. Using Safari 5 on Windows? For the moment, installing bookmarklets is the best option until we have cross-platform support. Stay tuned – we’ll update the blog with more information when we get closer to a release of the new plugin!